This is the Chadic language with the most speakers. Hausa is one of Africa’s largest spoken languages after Arabic, French, English, Portuguese and Swahili. About 34 million people in Africa speak Hausa as a first language and 18 million as a second. This language is the principle language of the Igbo people. They are an ethnic group in southeastern Nigeria. There are about 20 million speakers. It is written in Latin script and there are over 20 different Igbo dialects. Another common language after the main languages and mainly in West Africa. Number of speakers is estimated to be around 20 million total. Ibibio is the native language of the Ibibio peole of southern Nigeria. It is the offical language of Akwa Iborn State in Nigeria. Edo is native to Nigeria and is also called Bini. 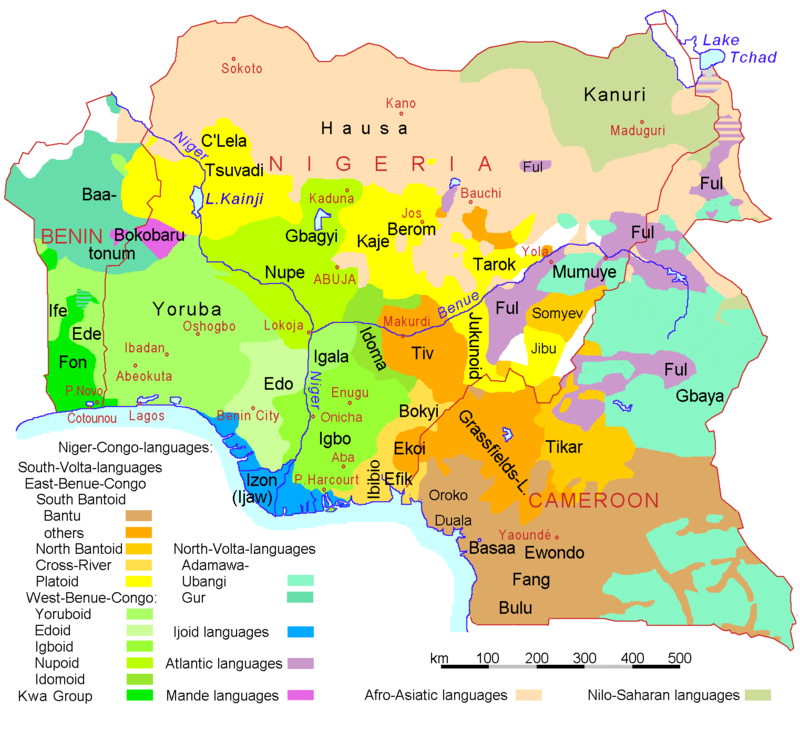 It is a Volta-Niger language spoken primarily in Edo State, Nigeria. It has 1 million speakers and is the primary language for the Edo people of Idodomigodo. Fulfulde, also known as Fula or Fulani is another language of West Africa. It belongs to the Niger-Congo language family and is spoken as a first language by the Fulbe people and related groups from Senegambi,Guinea, Cameroon, and Sudan. It has a total of around 24 million speakres. Kanuri is the final common ethnic language of Nigeria. It is spoken by some 4 million people in Nigeria, Niger, Chad, and Cameroon. It belongs to the Western Saharan subphylum of Nilo-Saharan. This is the languanges associated with the empires that dominated the Lake Chad region for thousands of years.